“Bonny and blithe and good and gay”. I’m not sure if this describes William, son of John RIDOUT and Martha SOMERTON, or not but he certainly strikes me as enigmatic. He was born in Bath on the 3rd October 1822 and baptised in March 1824. I can imagine him being taken by his parents on a chilly spring morning up to the Countess of Huntingdon’s Chapel in the Vineyards together with his little brother Charles and perhaps other members of the family. The boys’ baptisms were conducted by the Rev. Thomas Young (1764-1844) minister of the Zion Chapel in Margate and staunch supporter of the late Countess. I wonder if William was a well behaved little boy or a fractious ‘terrible two’. In the 1841 census, William at eighteen was described simply as a ‘turner etc’ presumably implying that he did various tasks relating to carpentry, no doubt using skills which he’d been taught by his father as later in life William would sometimes be described as a journeyman, implying his craft was learnt ‘on the job’ as an apprentice. He might have started off turning plain chair legs on a spindle lathe or perhaps he hollowed out wooden bowls using a face plate. I wonder if John’s lathe was operated by a treadle or was mechanical. William’s younger brother George was also a turner throughout his working life; I should think that finding steady work of this nature might have been a struggle, particularly in the later years. William's flamboyant signature, aged 19 in 1842. At the age of nineteen years and three months, William married Mary Ann SCOTT, a straw bonnet maker. The couple had lived next door to one another in Trinity Street but by 1841 Mary Ann, who was at least three years older than William, had left home and was lodging in nearby Westgate Buildings whilst he was still living with his recently widowed father. 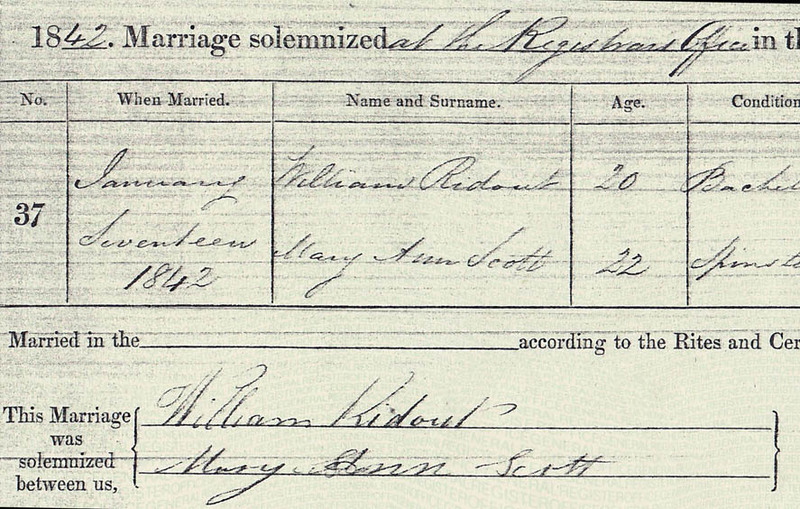 Interestingly, the witnesses to the couple’s marriage were a chap called Samuel BURGE, a twenty-one year old printer and his very soon-to-be wife, Mary SMALLCOMBE; Samuel had been lodging with William’s father in the 1841 census and so presumably the boys had become friends and decided on a double wedding in the Registrar’s Office. I noticed on Samuel’s certificate that he and Mary were married ‘according to the rites of the parties before me’, in other words as non-conformists. I had wondered if William and Mary Ann were non-conformists too but their daughter Martha Ann’s baptism at the Holy Trinity church in Walcot suggests not – her arrival just four months after the wedding perhaps explains the groom’s tender age! More children followed Martha Ann: Emily Elizabeth (1843-1928), William Henry (1845-1912), Frederick George (1846-1848) and Alfred Charles (1848-1879). “Court ‘Concord’, No. 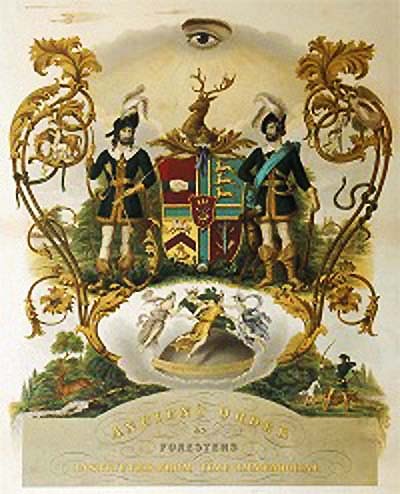 2003 of the Ancient Order of Foresters (AOF) was founded in Bath in 1845. It was the practice of Courts in a particular area or region to associate with each other. The main purpose was to operate a Funeral Fund for all members in all constituent Courts. This reduced the likely burden on any one Court experiencing say an influenza epidemic and having to pay out a large amount of money at one time. There were also administrative reasons for Districts – they provided a conduit through which the National Executive Council of the Order could communicate with Courts without having to write to them all individually, but rather using the District set up for that purpose. Bro. 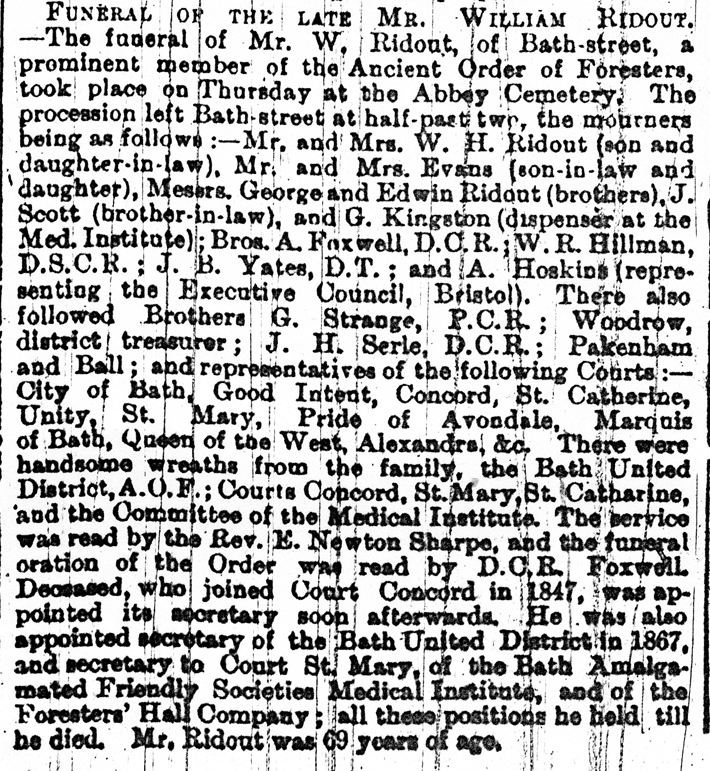 Ridout was the Secretary of two Courts and the Bath United District, so paperwork must been one of his strengths. Secretaryship of the District was no small enterprise; in 1890 it comprised some nineteen Courts in and around Bath. The Bath Amalgamated Medical Institute was founded in 1884. The purpose of this organisation was to provide medical treatment and medicines for members and families of all contributing constituent friendly societies. In Bath in 1890, the Medical Institute was subscribed to by fourteen societies, with 2,053 members. Receipts for 1888 were £658, payments £568. The 1851 census showed William and Mary Ann together with their children Emily Elizabeth, William Henry and Alfred Charles. Also staying or living with the couple were John, William’s father and Edwin, his younger brother. The address was 18 Upper Trafalgar Place, which was in Holloway. I imagine this was only a modest sized cottage so things must have been a bit of a squeeze. By 1861, William and his two sons were in 5 Caroline Buildings, a pleasant rank of houses at the Widcombe end of Pulteney Road. There was no sign of Mary Ann though and, despite thorough searching, I have been unable to find her. Her marriage certificate showed that Margaret, whose maiden name was BLATCHLEY, had been married to John Trousdell a painter, eighteen years her senior, who had left her widowed in 1866. William and Ellen were together for twenty-six years until death claimed her at the age of sixty-two. She was buried in the Abbey cemetery but, although I visited this closed, rather overgrown wildlife haven, I did not find a stone marking Margaret’s grave. Licence transfers for the Canal Tavern. William's entry in 1875. On 20th November 1875, William was granted the licence of the Canal Tavern public house, at the junction of 1 Ebenezer Terrace and Coburg Place in Widcombe. According to Andrew Swift and Kirsten Elliott’s excellent book ‘The Lost Pubs of Bath’, this was a “fairly opulent establishment with its own brewery”. In 1908, the Widcombe Baptist chapel’s schoolroom was built where the pub had been. Behind, the Ebenezer Chapel blazons evangelical messages on its roof: ‘Prepare to meet your God’- a prospect I always found rather frightening as a small child! Anyway, William kept the licence until November 1882 and so was recorded here in 1881 as an ivory and hardwood turner. This signified to me that he was a really skilled craftsman as he was working with such expensive materials. So, by his late fifties, William still turned the lathe, ran a pub and organised several AOF Courts – he was certainly no Victorian couch potato! 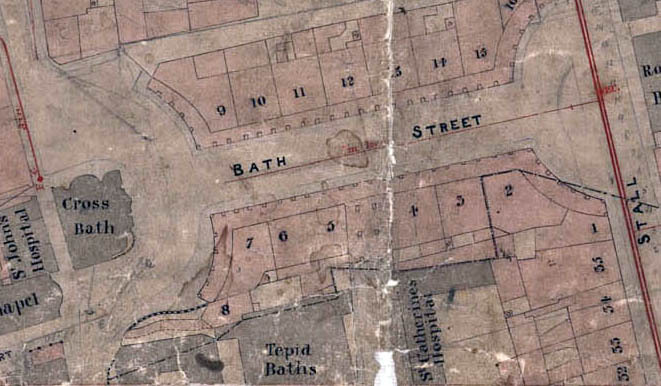 Cottell's map showing numbers 3 and 4 Bath Street. In 1891, William was at 4 Bath Street, probably the address of the Forester’s Hall. Although he was ‘retired’, I wouldn’t be surprised if he had still been working for the AOF. On this particular April day, William was with a fifty-four year old lady, Ellen NOOK. I can only speculate on what their relationship might have been – was she a friend, a visitor or did they enjoy a more intimate relationship? The couple had not disclosed the nature of their connection to the enumerator. By this time, William was sixty-eight and entering the final year of his life. Maybe Ellen was his nurse. William died of pneumonia on the 2nd May 1892. I hope his illness was bearable and his end peaceful; I think he deserved it. He has the honour of having the only published obituary in my family that I have as yet found. The piece appeared in the Bath Chronicle on May 12th 1892. NB. DCR: District Chief Ranger. Even after his death, William’s duty to the Foresters lived on. His will comprised complex instructions which, when interpreted, meant that everything he owned went, not to his family but to two trustees who would administer a ‘Ridout Fund’, paying the interest on his invested capital once a year to whichever Court in Bath showed the best balance sheet! William wanted to be remembered. His grave, like that of his second wife, is in the Abbey cemetery and is now unmarked by a stone, if there had ever been one. 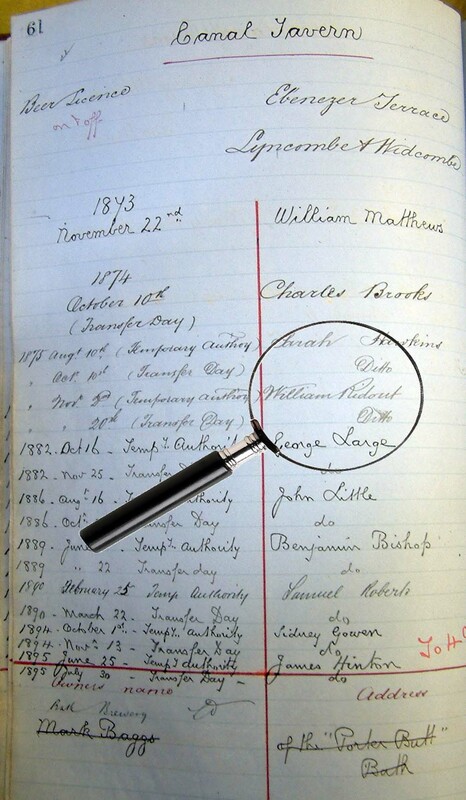 The detail in the burial register shows that he had his own new, private plot, not sharing with anyone. A hard working man; utterly dedicated to his one passion – I wouldn’t be surprised if perhaps his private life had lacked a little something? This entry was posted in Individual and tagged Ancient Order of Foresters, Bath, Charles BLATCHLEY, Countess of Huntingdon, Ellen NOOK, John TROUSDELL, Margaret Ellen BLATCHLEY, Mary Ann SCOTT, Newspaper, William RIDOUT. Bookmark the permalink. Hi there, I have kind of an obscure question. Where did you find your photo of the Crest of the Ancient order of Foresters ? I found that particular poster among some family items and am seeking more information about it. I was unable to find the image online other than your blog. Thanks! The Beatons of Somer… no – Dorset! Giles Ridout of Virginia or John Ridout of Sherborne (b.1699)? Exciting genealogical news… two families linked by DNA? Charles Vie Ridout – the man that nearly wasn’t. The Compton Abbas Rideouts: Thomas and who? The Ridout book is finally published! The book that got away! …. and now for something completely different! Age Shall Not Weary Them…. Walter Rydowte of Folke, a gentleman and a rebel! William Rydeowte of Chettle – a 16th century gentleman! Richard Ridout of Sherborne and Richard Ridout of North Wootton: the same man or not? Jeremiah & Porter Ridout: yellow silk shoes and blue murder! The Nethercombe Ridouts in Sherborne: have I found my line?